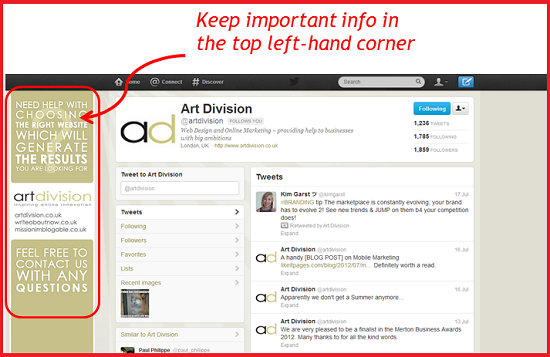 Online Marketing for businesses with big ambitions: How to Make a Great Twitter Background? After looking last week at some terrific Twitter backgrounds, this week we'll be sharing some top tips to ensure you can create the perfect background for your page. This means that all important information needs to be on the left hand side. This is even though the "Twitter" panel is centered on the page. As your background is fixed to the left hand side of the browser, if a visitor views your page with a wide screen, they may not see the right hand side. To reach the majority of visitors, use between 66px and 194px for the left hand panel. The "Twitter" panel has a fixed width of 865px. This means the rest (width dependant on the monitor) is free for the background. Use the same colours and logo as on your website in your background and profile picture. - too much text or detail will distract from your Tweets, so avoid this! 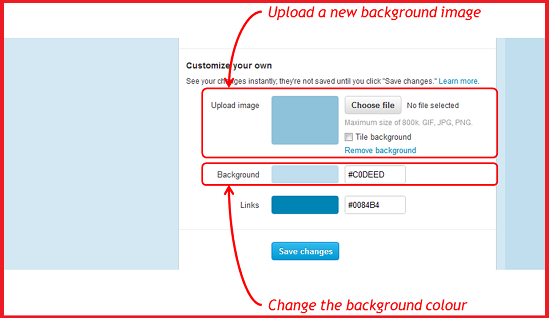 If you select the same background colour (via Twitter) as your background image, the two will blend together. This can be great especially if you have a shorter image. The easiest way to do this is pick your colour via Twitter, and then afterwards use this as the basis for your background image. This means it will be of a higher quality than .JPEG, so any detail (such as text) won't be lost. Click on "Edit your profile"
Scroll down, and you can upload a new background image and change the colour.